When Moses Chan and Aimee Chan’s son, Aiden Joshua Chan, was born in December 2013, the couple shared only a photo of Aiden’s small hands holding Aimee’s finger. Since then, the TVB artistes have kept their distance from the media to shield their son from the public’s spotlight. Aiden’s face remained as a mystery for many months. Aimee, who originally planned to film a new TVB drama in the latter half of the year, decided to prolong her hiatus so she can take care of Aiden for the rest of the year. Allegedly, Aimee plans to breastfeed Aiden for an entire year, thus she had no choice but to indefinitely postpone her TVB comeback. Aimee’s delay to return to work may have upset TVB. To make up for the loss, Moses has reportedly agreed to film the new comedy drama Opera Rouge, replacing Wayne Lai. The romantic comedy also stars Joyce Koi. 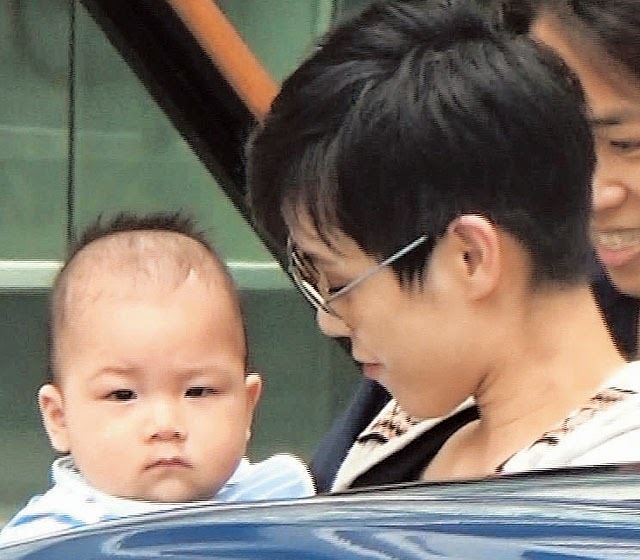 Despite the couple’s secrecy, the Hong Kong paparazzi finally managed to snap a photo of their seventh-month-old son earlier this month. On June 10, while getting off of their seven-passenger minivan to have lunch with their friends, stealthy reporters quickly took a photo of Aiden, who was tucked in Aimee’s arms. The chubby baby shares Aimee’s eyes and Moses’ nose. Moses dotes on little Aiden, and would occasionally rub his bald head every few minutes. Aimee had on a cast on her left wrist, and it is assumed that she has De Quervain syndrome, also known as “mother’s wrist.” According to reports, the couple’s minivan was purchased with the sole purpose of shielding Aiden from persistent photographers. Normally, the couple would use other transportation means when leaving their home. Moses and Aimee also seem to know the paparazzi’s stalking schedules, as whenever they leave their home with Aiden, they would choose the earliest hours of the day to evade reporters.